Elena Volpato, VideotecaGAM’s curator, presents videos of street politics animations by Piero Gilardi shown until June 2016. May days in Turin 1981-2013 is the title of the exhibition that inaugurates the 2016 at VideotecaGAM dedicated to political issues and to the awareness of the importance that these street animations assumed not only for Turin but for all those generations that lived the great changes in the political history of our country. 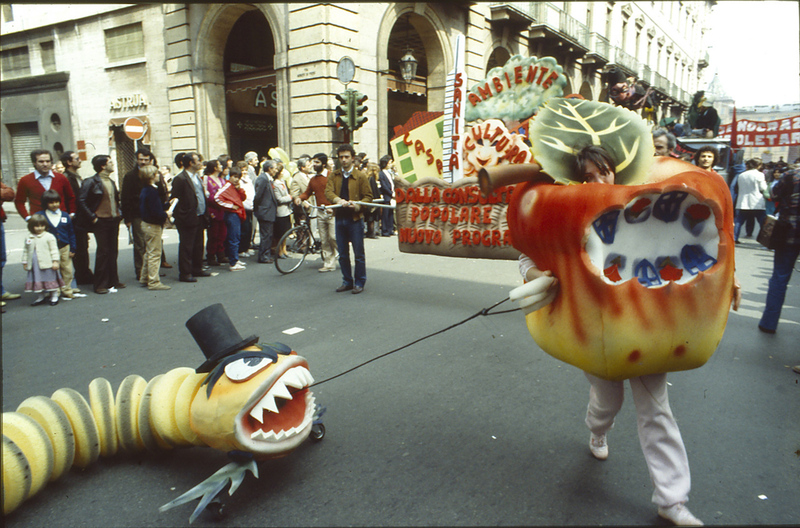 Street theatre is a form of expression that distinguishes Piero Gilardi in his being an artist and promoter of such performative initiatives that began in the mid-seventies and lasted until today. 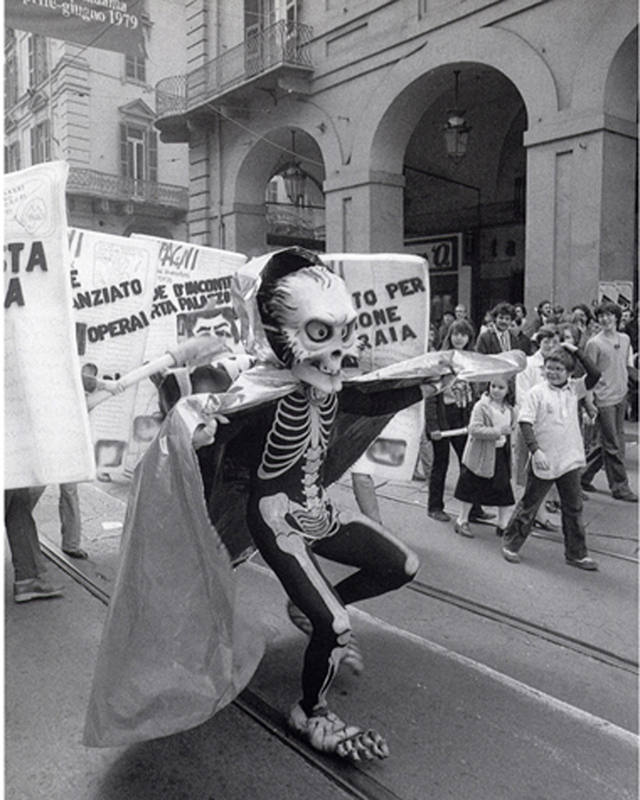 His militant and relational art, rejecting the traditional systems of art and going towards the masses, is well documented in the videos representing directly or indirectly the artist in Turin parades of May the 1st, Labor Day. Piero Gilardi himself declared in his book Dall’arte alla vita, dalla vita all’arte (1981) to be “personally engaged in a cultural process of historical breath” and it’s for this reason that, from an intuition of the late sixties, he always tried to bring art into life through the rejection of the artistic dictates and, after his exit from the art market, the direct political participation. The result was a collective artistic practice linked to concrete life but subordinated to the ideology put into effect through the conception and participation of the collective La Comune of Turin, after the split with Dario Fo in 1974. The interest in the political problems of basic culture by the communist organization Avanguardia operaia gave a strong twist to the collective that began to intervene in the demonstrations of May the 1st from 1977 onwards with the street theatre that becomes the expression of a political, historical, nonetheless artistic period. Piero Gilardi shares with the community his art and his being an artist in the world not only limiting himself to the denunciation of political oppression but by acting as a form of exploitation of the marginalized portions of society. Even today Piero Gilardi blindly continues his struggle for the transformation of everyday life through the PAV-Parco Arte Vivente where, promoting a new vision of the living art, he experiences interactions and installations of environmental and ecologic artworks. Thanks to the collaboration of the curator and director of VideotecaGAM, Elena Volpato, it was possible to investigate and explore some historical and artistic aspects of the exhibition as well as the archival and conservation issues related to the acquisition by the artist video collection. Valeria Ceregini: How has begun the dialogue between the VideotecaGAM, of which you hold the role of manager, and the archive of the Fondazione Piero Gilardi? Elena Volpato: More than a dialogue between institutions, it was of a personal nature. My desire was to enrich and continue the series of meetings and exhibitions with which the VideotecaGAM is retracing some aspects of the history of video in Italy in the sixties and seventies. Piero Gilardi’s work represents an essential chapter that has allowed me to re-think the relationship the video had with performances and street theatre and learn how it played as instrument of some social issues and radical policies of those years. Piero Gilardi has embraced the social and political commitment with a coherence that few others have been able. When, thanks to the funds of the Foundation for Modern and Contemporary Art CRT, I was able to assure our archive the assembly of many of the performance imagined by Piero Gilardi and his collective to the events of May the 1st, it seemed natural to ask the artist to present to the public of VideotecaGAM an exhibition that showcased the part of his work as purely political. V.C. : Which particular attention aroused in you videos of Piero Gilardi animations? And, most importantly, what contemporary artistic value and future potential you spot in them since they have become an integral part of the heritage of the museum videos? Elena Volpato: Their value is historical and documentary. Street theatre is an art form that survives in time only through the documents. The extraordinary nature of the project and of the video lies in the artist’s punctual commitment and the ability to be able to read the story and consistency over the years through the assembly. V.C. : The videos of Piero Gilardi have as protagonist collective politics animations that have taken place through the streets of Turin, as evidenced by some of the videos on display. As civic museum, your aim was to highlight their documentary value especially for the city of Turin? Elena Volpato: I would say that their value is universal. Politics issues raised by these animations are national in nature. The irony objects are usually government representatives. Of course, Turin is not a city like any other. Here forty thousand workers in 1980 marched through the streets in protest. They marched along the Via Roma we see populated of protesters in the Piero Gilardi’s footages. That was a defining moment in determining some choices even existential for the artist. V.C. : In addition to being responsible for the Film and Video Artist Collection, you also hold the role conservator. It’s why I would like to ask you in which kind of support the videos of Piero Gilardi were acquired and what conservative and archival methods are provided for their preservation and enhancement? Elena Volpato: We acquired the videos in the form of digital files. Currently there are no practices that enable secureness of the original quality of the work that we still receive as a result of multiple passages from film to video. The only precaution is to back up and continued practice of spills. Cover Image: May 1st 1983, Turin. Collettivo Grafica e animazione. Credits Fondazione Centro Studi Piero Gilardi.